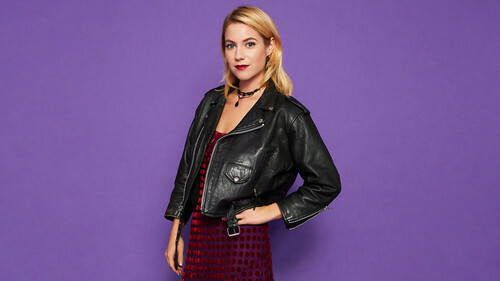 Laura Ramsey in 'Hindsight'. Laura Ramsey as Becca in a promotional photo for Season 1 of Hindsight.. HD Wallpaper and background images in the Laura Ramsey club tagged: hindsight season 1 2015 promotional photoshoot portrait laura ramsey becca. This Laura Ramsey photo might contain well dressed person, suit, pants suit, pantsuit, hip boot, thigh boot, overgarment, and outer garment.